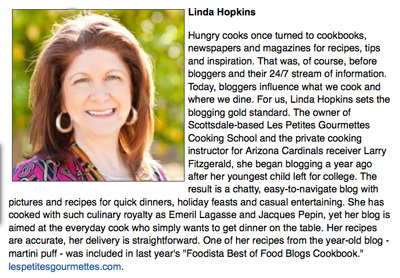 [EXCERPT] There are even two recipes from Valley chefs: Barbara Fenzl, cookbook author, PBS cooking show host and founder of Les Gourmettes cooking school in Phoenix, shares a chayote squash soup; Linda Hopkins, owner of Les Petites Gourmettes children’s cooking academy in Scottsdale, offers herbed phyllo-and-cheese appetizers that can be stored in the freezer and baked at the unexpected ring of the doorbell. 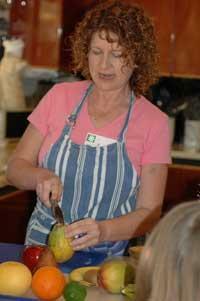 [EXCERPT] A couple of years ago, I was invited to attend a cooking class for a group of girls from the Boys & Girls Clubs of the East Valley. The girls were part of a Junior League-sponsored program called Kids in the Kitchen, designed combat childhood obesity by teaching children about nutrition. 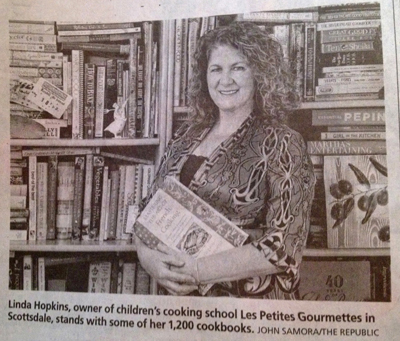 The class was held on a Saturday morning at the home of Les Petite Gourmettes founder Linda Hopkins (that’s her at left). 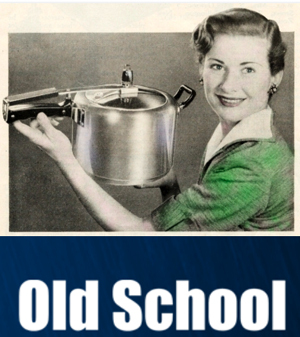 Her kitchen smelled wonderful; she had started her crockpot early and the savory aroma of slow-cooked chicken and spices had my stomach growling with two hours to go until lunchtime. 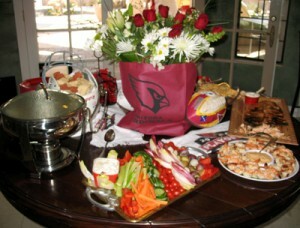 source link Super Bowl Party Menu prednisone 10mg tablets 5442 as Featured in the Arizona Republic [EXCERPT] Fitzgerald’s personal cooking instructor created a special Super Bowl XLIII party filled with favorites of the 25-year-old former college All-American. “Larry loves to cook, and there’s no better way to honor Larry and his team than with the food he would want to eat if he were watching instead of playing,” said Linda Hopkins, who meets with Fitzgerald for a weekly cooking lesson. 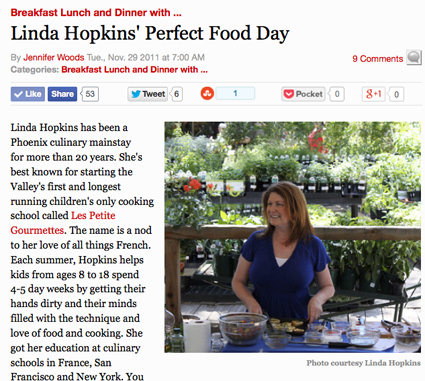 December 26, 2012 article on Millennials and Recipes. Check it out HERE in the Arizona Republic or HERE in USA TODAY. Cooking with Beth & Bill 1996 featuring Linda teaching Beth, Bill, and Beth’s children to make homemade pasta, resulting in some hilarious results. 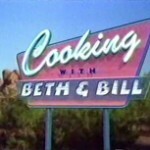 Cooking with Beth & Bill 1997 featuring Linda of Les Petites Gourmettes with 6 year old son, Connor, making homemade pizza.